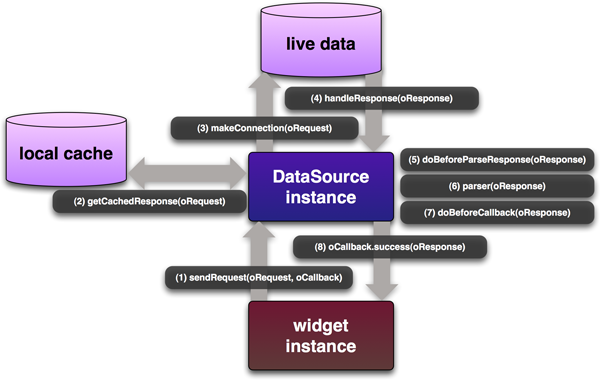 The DataSource will request data and then return the response to a callback function. It has the capability of going deep into the hierarchy of the source data, selecting specified fields from the raw output, parsing data as indicated and calling the provided callback function when finished. The DataSource has an optional local cache to store retrieved and parsed data. It can also be set to periodically poll for data. Note: As of the 2.6.0 release, DataSource has been refactored into a base class and subclasses. While backward compatibility has been maintained whenever possible, implementers who are upgrading from an earlier version are strongly advised to read the Upgrade Notes to smooth the transition. Examples: Explore examples of the DataSource Utility in action. API Documentation: View the full API documentation for the DataSource Utility. Release Notes: Detailed change log for the DataSource Utility. Download: Download the DataSource Utility as part of the full YUI Library at YUILibrary.com. The DataSource class has been refactored into a DataSourceBase base class and the subclasses LocalDataSource, FunctionDataSource, XHRDataSource, and ScriptNodeDataSource. While backward compatibility of the YAHOO.util.DataSource constructor has been maintained, implementers should be aware that calling new YAHOO.util.DataSource() now actually returns one of these subclasses. Implementers can alternatively call a subclass constructor directly. The DataSource constructor returns one of the subclasses based on the oLiveData passed to it, or the dataType config value. This class-based architecture no longer meaningfully supports swapping data types on the fly. Parsing of totalRecords is no longer supported as a top-leval schema value. Implementers should access this data as a metaFields value. success Function The function to call when the response is ready. failure Function The function to call upon a response failure condition. scope Widget instance The object to serve as the scope for the success and failure handlers. argument Object Arbitrary data to be passed back to the success and failure handlers. Not finding a cached response will cause the DataSource to make a connection to the live data. Depending on the dataType, the connection may make a remote connection via Connection Manager or the Get Utility, or simply access local data in thread. A response from the live data set is returned to the DataSource in its raw state. The doBeforeParseData() abstract method allows implementers to access and transform the full response before it is schema-parsed. The DataSource parses the raw response according to responseType and implementer-defined schema. The doBeforeCallback() abstract method allows implementers to access and transform the parsed response before it is cached. tId Number Unique transaction ID number. results Array Schema-parsed data results. error Boolean Indicates data error. cached Boolean Indicates cached response. meta Object Schema-parsed meta data. The simplest type of DataSource points to an array of strings, such that each result is a string. fields Array Array of strings to name the data fields represented by the data. Because DataSource assumes a tabular (two-dimensional) data structure, a simple array of strings is considered to contain only one field of data. A more common type of DataSource points to a complex array of nested arrays or JSON objects that represents a tabular (two-dimensional) data structure. Fields are used to assign a name to each field of data. fields Array Array of string names for each field of data coming in. For nested arrays, the array index of a field maps it directly to the array index of the result data. For nested objects, the order of the fields is irrelevant since the name of the field maps to result data, and data values that don't have a defined field are ignored. resultsList String Dot-notation location to results. Not all data is required to have a field. fields Array String locator for each field of data coming in. metaFields Object (Optional) String locator of additional meta data. // oParsedResponse.meta.something === "pot o' gold"
A schema for XML data requires a pointer to each result node, in additional to defining fields of data held in each node. Optionally, a metaNode and metaFields may be defined to access additional meta data. Location pointers to XML data can be valid XML node names, attribute names, or preferably, XPath syntax locators. Set the useXPath property to true for XPath support in your locators. resultNode String Name of the node assigned to each result. fields Array String locator for each field of data coming in. Not all data is required to have a field. metaNode String (Optional) String name of the node under which to search for meta data. There is a known and constant string delimiter of records. Within each record, there is a known and constant string delimiter of data fields that is not equal to the record delimiter. recordDelim String Character(s) that delimits each record. fieldDelim String Character(s) that delimits each field within each record. DataSource supports consuming data out of an HTML table element. By default, DataSource will iterate over all TR elements of all TBODY elements of the given TABLE to parse out data. If there are any non-data elements (like summary rows or the message TBODY in DataTable), they should first be removed from the DOM. fields Array String name for each field of data coming in. The array index of a field maps it to the cellIndex of the result data. Data supplied by the DataSource may need to be type-converted before it can be consumed. This is especially true for XHRDataSources or progressive enhancement scenarios where data may be intended to be of type Number, but gets loaded as type String. Parser functions can be assigned to convert data on a per field basis. The cache will be updated when polling but won't be used for retrieval. Cache entries are indexed by the oRequest (first) argument of sendRequest. There will be one entry per request up to the total of maxCachedEntries. The setInterval method can be used to repeatedly poll for data. The first argument is the number of milliseconds to wait between requests, and the following three arguments are the same as those of sendRequest. This method returns a numeric identifier that can be used to cancel the polling. Polling can be cancelled by calling clearInterval and passing it the identifier returned by the call to setInterval. All polling can be cancelled by calling clearAllIntervals. Please note that existing transactions will not be canceled. DataSource offers several hooks can be used to monitor the progress of the data request/response cycle or perform transformations on the response along its journey back to the callback. Fired when a request is made to the local cache. Fired when data is retrieved from the local cache. Fired when a request is sent to the live data source. Fired when live data source sends response. This overridable abstract method gives implementers an opportunity to munge the data before it is schema-parsed. Implementers should be sure to return data in a ready-to-parse state to avoid errors. Fired when response is parsed. Fired when a data error is encountered. This overridable abstract method gives implementers an opportunity to access the data before it has been cached or returned to the callback. Implementers should be sure to return data in a ready-to-return state to avoid errors. connMethodPost Boolean false True if data is to be sent via POST. By default, data will be sent via GET. connMgr Class YAHOO.util.Connect Alias to YUI Connection Manager, to allow implementers to use a custom class. connTimeout Number 0 How many milliseconds the XHR connection will wait for a server response. Any non-zero value will enable the Connection Manager's Auto-Abort feature. If a request is already in progress, wait until response is returned before sending the next request. If a request is already in progress, cancel it before sending the next request. Send all requests, but handle only the response for the most recently sent request. Send all requests and handle all responses. Special considerations need to be made when using a DataSource that supports asynchronous request/response cycles, including state validation in the sendRequest() callback's success and failure handlers. In the case of YUI widgets consuming DataSource, these handlers will want to verify that the widget instances themselves are still valid. getUtility Class Alias to YUI Get Utility, to allow implementers to use a custom class. XML is not currently supported on Android devices.